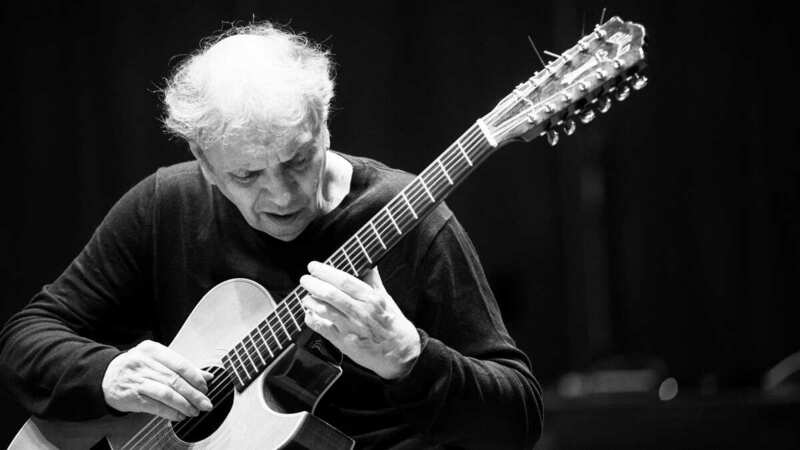 Ralph Towner: An Old Hand With A 'Foolish Heart' (And An Unmatched Style) The guitarist who composed "Icarus" — a tune so popular, astronauts took it to the moon — has a way of playing that seems to conjure melody, rhythm and harmony all at once. Ralph Towner's latest album is My Foolish Heart, named for the Bill Evans tune that changed the way he looked at composition and his instrument. Ralph Towner first came to the attention of a wide audience nearly 50 years ago as a member of the Paul Winter Consort, for whom he composed the group's most famous tune, "Icarus." The piece was so beloved, the Apollo 15 astronauts took the record to the moon — and named a crater after it. Today, Towner is in his 70s and still going strong. He's best known as an acoustic guitarist, and was born in Washington state. But he grew up a piano prodigy in a town in Oregon. "Nobody knew what to do with me," Towner says. "Had I lived on the East Coast, I think I might have been immediately sent to a music school very early. But as it was, I had a sort of simplistic childhood — kind of Norman Rockwell style." That bucolic young life came with a soundtrack: His father played trumpet and his mother was a piano teacher. "I would go to this old piano that we had and, in the beginning, I would just hold down the pedal and hit something and let it ring," he says. "I remember just being enthralled with hearing this chord sustain and then slowly disappear." "He already came into this life with a level of talent that many people don't have," Gary Peacock says, and he would know: He's Keith Jarrett's bass player, a composer in his own right and a longtime collaborator of Towner's. He says the latter has a talent few possess. "Ralph has incredible ears," Peacock says. "I remember on a tour one time, I walked into his dressing room just to see if everything's OK ... and he's playing three notes on his guitar, over and over again. And then maybe adding something, over and over and over. Anybody walking by would think, 'What is he doing?!' What he's doing is listening. Listening to what is there and, now, what comes next." Towner began playing piano when he was 3, and took up trumpet two years later. He wound up at the University of Oregon studying art, before eventually switching to music composition. It was there that he first heard a record by a musician who would become one of his biggest influences: pianist Bill Evans and his legendary trio. "I always wanted to record 'My Foolish Heart,' " Towner says. "It's one of the first tunes I'd heard that combination of Evans, [Scott] LaFaro and Paul Motian play. So that tune had a lot of meaning for me and was very important for me starting out as a jazz musician." Towner finally recorded it for his latest album, which is also called My Foolish Heart. It was also at college that Towner first heard a classical guitar. "I never was really attracted to the guitar until I heard a classical guitar," he says. "For me it's like a small piano in what you can do with it, in terms of moving secondary voices around in your music. You can play all these notes with all the fingers of your right hand." Towner has developed an instantly recognizable style, one that sounds like he's playing with all 10 fingers of both hands — conjuring melody, harmony and rhythm almost simultaneously. Woodwind player Paul McCandless, who has been collaborating with Towner for nearly half a century, explains it this way: "You hear the bass, you hear the chords, you hear the melody. The illusion is created that there's a whole ensemble playing — a whole world that he creates just with the guitar." Towner and McCandless' partnership began in the Paul Winter Consort and continued in the group that split off from the Consort, Oregon. Towner has been Oregon's primary composer since the beginning, and the classically trained McCandless says there's a reason. "These pieces that Ralph created — I always say that if you change one note, it wouldn't be as good ... [similar to] the way Mozart and his music are irreducible," he says. "I think that Ralph's gift for melody, and singable melodies, really transport the listener to another world." Towner just turned 77, and the history behind his new album brings that tune he heard Bill Evans play all those years ago up to the present. "There's a little irony in it, since I just had a pacemaker put in about two years ago," he chuckles. "We had a concert in Germany and, uh, I fell on my face on the first sound check and had to go to the hospital; I'd kind of blacked out. Turns out that my heart was beating so slow. And so I called the whole CD My Foolish Heart. I hope it's over its foolishness!" Web editor Daoud Tyler-Ameen contributed to this story. The audio story accompanying this piece is incorrect. While Towner was born in Washington state, he lived in Oregon from the age of 5, according to his website. He also attended the University of Oregon, and not the University of Washington. The same errors in a previous version of this digital story have been corrected.